One of the joys of archive work is that new objects are always coming to light! Witness a recent discovery by the Institute of Archaeology at the University of Oxford. Clearing the basement for building work, staff found a mysterious box containing flint arrowheads and other archaeological finds. It was tantalisingly labelled ‘Jacquetta Hawkes? Portugal?‘. To cut the story short, the puzzled labeller was right. Investigation, including a look at our Jacquetta Hawkes archive, reveals that the objects were presented to Jacquetta during her 1949 lecture tour of Portugal. I’ve been meaning to write about this trip for a while. We have a candid report by Jacquetta on her experiences plus letters from the new colleagues she met there. So look out for that piece! Meanwhile, you can learn more about the contents of the mystery box in ‘The Jacquetta Hawkes Collection, Portugal, 1949’, a blog post by undergraduate Dalva Gerberon, who studied them as part of her fieldwork. Our friends at Trowelblazers are working on an amazing project to celebrate women working in archaeology, geology and palaeontology in the past and present. Raising Horizons, created in partnership with photographer Leonora Sanders, will be a multimedia exhibition which pairs a modern woman with a historic counterpart. 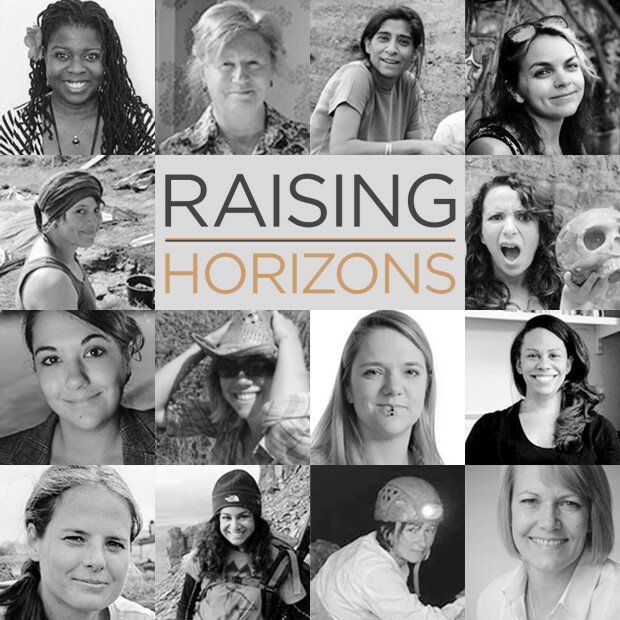 Raising Horizons logo featuring modern women working in archaeology, geology and palaeontology. We are delighted that Jacquetta Hawkes is one of the trowelblazers. Her partner is Dr Colleen Morgan of the University of York. They have in common their “explorations of archaeology, its practice and meanings across many different channels, from academic articles to artistic endeavours”. Find out more about both of them and the other trowelblazing partners in this blog post and this Guardian article about the project. Help support Raising Horizons through the crowdfunding site Indiegogo. Jacquetta Hawkes and her archive continue to inspire artists and curators! “The sun went in, the fire went out” is a new exhibition which uses Jacquetta’s experience to present art made by three avant-garde female artists active during the 1960s and 1970s: Annabel Nicolson, Carlyle Reedy, and Marie Yates. The curators, Karen di Franco and Elisa Kay, also explore parallels with the work of modernist writer Mary Butts, who, like Jacquetta, was a well-known figure who became marginal – and is now being rediscovered. What do these women have in common as artists? The qualities characteristic of A Land, Jacquetta’s greatest and most distinctive work: “resistance to easy categorization, concern for process, and understanding of physical and cultural landscape”, to quote an enthusiastic review by Jonathan P. Watts for Frieze magazine. “The Sun went in, the fire went out: landscapes in film, performance and text” is on show at CHELSEA space, Chelsea College of Arts, from 27 January to 4 March 2016. 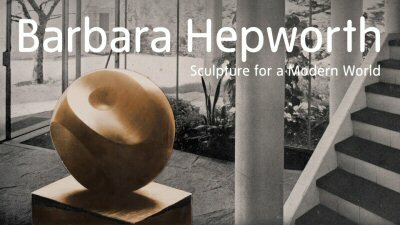 The sculptor Barbara Hepworth developed her unique vision early in life – her career refined and developed this into art. We have seen something similar with her near contemporary, Jacquetta Hawkes, and her interest in the deep past. Both artists were drawn to the qualities of stone and of landscape, the visual, the tactile – a romantic, lyrical, British take on modernism. 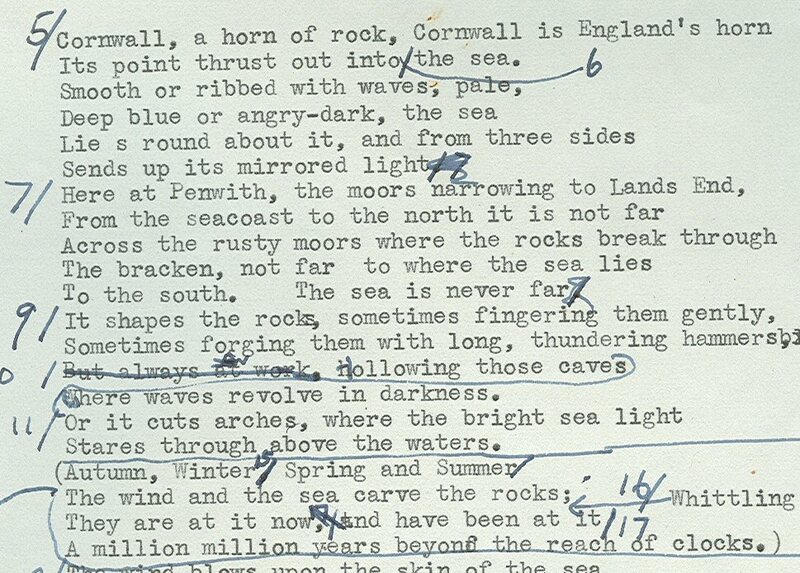 They came together on the experimental film Figures in a Landscape, for which Jacquetta wrote the script, characteristically setting Hepworth’s art in the context of Cornwall’s geology. Again and again the director, Dudley Shaw Ashton, shows us natural forms in the landscape which then merge with Hepworth’s created forms. We see her creating too, at work in her studio, hewing her ideas out of the rock with chisel and saw; hard, physical work requiring strength and finesse. The film uses strident music by Priaulx Rainier and saturated 1950s colours to striking effect. Before I saw it, having read the script, I’d pictured the black and white, wild, romantic Du Maurier Cornwall depicted in films of the period. I remember being surprised and even unsettled by the way the elements of the film were put together, and it made me look again at Hepworth (who, like Henry Moore, may have suffered from over-exposure as a certain kind of public art, ubiquitous and often unloved in public spaces during the 1970s). This intriguing film is on show as part of a major Hepworth retrospective. Open from 24 June-25 October 2015, Sculpture for a Modern World has been extensively reviewed and discussed and will bring Hepworth and her contemporaries to new audiences. I hope to visit the exhibition next time I am in London – watch this space! Why do Earth’s continents fit together so neatly? Were they once joined together? If so, why did they move apart? Are they still moving and if so, how? The theory of plate tectonics, developed during the 1960s, elegantly answers these puzzling questions. The continents are on plates which move thanks to convection, grind against each other and move as new rocks rise up through the ocean ridges and push the plates apart. We now see that Earth’s geology is a dynamic, living system, with renewal centred on the sea bed. When Jacquetta Hawkes wrote A Land, this theory hadn’t yet taken shape. Geological change in her worldview was overwhelmingly vertical: land rose through volcanic activity and was then worn down, endlessly. “For [Carson], and for Hawkes, the ocean floor was the basement, the foundation, the oldest part of the planet. It was pretty difficult to imagine how a continent could migrate across it. The seeming snugness of fit of the Brazilian bump and the west African concavity was just as likely to be a co-incidence: just one of those puzzling things in a perpetually puzzling world. There were, indeed, as both writers seem casually to concede, schools of thought that contended that continents could move. It was just that nobody could imagine how the continents could have moved, and then propose an empirical way of proving that they did”. 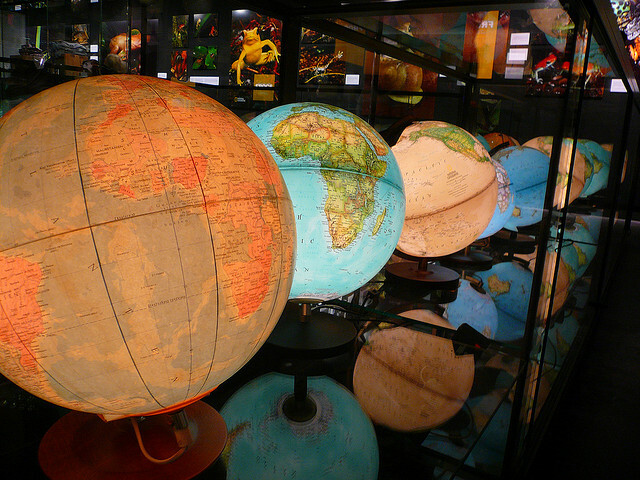 Photo credit: Globes in the National Geographic shop, Regent Street, 2008. Ricardo’s flickr stream, CC BY 2.0. 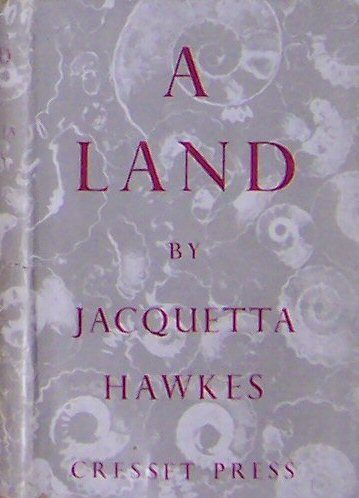 A Land, the unique, unclassifiable book Jacquetta Hawkes was born to write, is celebrated in the latest publication from nature writer Robert Macfarlane: LANDMARKS. Landmarks is a word-hoard, a glossary of disappearing dialect words for British nature phenomena, a celebration of the particular and the specific (qualities to which Jacquetta was of course drawn in her own writing). Macfarlane reflects on his own journey into nature writing and the authors who influenced him. He describes A Land as the “stone-book” of his twenties and devotes several pages to reflections on its power and strangeness. Macfarlane always has interesting things to say about A Land, a book he has clearly pondered over many years. I noticed the way he discusses an interesting paradox in A Land. Its scale is both very broad – spanning millennia, transcending ideas of nation/country/race, absurd when seen from the perspective of deepest time – and very precise. It is recognisably a product of its particular time and place: New Elizabethan Britain: the era of the Festival of Britain, renewal after the privations of post-war austerity, the romantic modernism of Barbara Hepworth and Henry Moore. As Macfarlane notes, Jacquetta shaped the relationship of these disparate elements with aplomb and daring, zooming from her own garden to the Cretaceous and bringing all together with passion, deep knowledge and honesty. 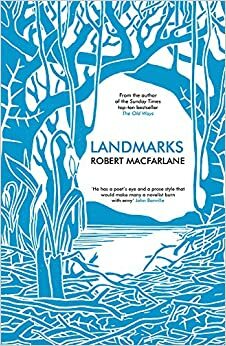 From Aquabob to Zawn, Guardian article by Robert Macfarlane about the word-hoard in Landmarks & some (very positive) reviews of the book: Guardian, Independent, Telegraph, Times Higher Education Supplement.